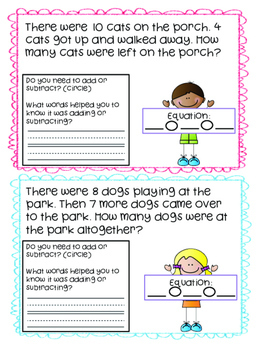 Word problems within 20, including problems that will require students to use a ? for a missing number within the equation they write. 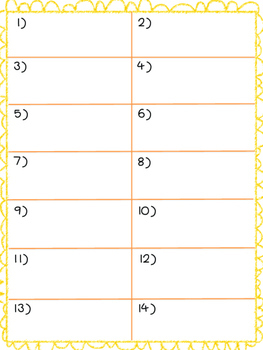 There is a place to write the equation they make on the card, as well as a place to record their problems and how they are thinking it through on a turn in sheet for the teacher to see. 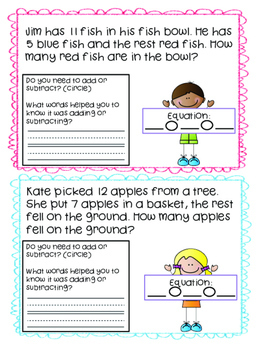 The cards with the word problems on it also include a section where students need to indicate if they are being asked to subtract or add, and then they will need to write how they knew whether to add or subtract.